David Jeong, MD, has achieved an impressive goal this month: He’s made it to the Olympics. The director of sports medicine and geriatric musculoskeletal medicine at SIU Center for Family and Community Medicine in Springfield is directing medical teams at the 2018 Winter Olympics in PyeongChang, South Korea. His staff will provide care and treatment for the world-class athletes at the Sliding Center, home to the luge, skeleton and bobsled competitions. The Olympic Games will be held February 9 - 25. Dr. Jeong completed his residency in family medicine at SIU School of Medicine in Springfield and a sports medicine fellowship at SIU Quincy Family Medicine. Before departing for South Korea, he answered some questions. How did you get started on this path to the Olympics? As a young boy in South Korea I dreamed of becoming a doctor to help take care of athletes. Sports medicine is not a well-known field in my home country. Very few people practice it. I learned how advanced sports medicine training is in the United States, with not only orthopedic surgeons, physical medicine and rehabilitation specialists, but also primary care physicians involved in sports medicine. I was really interested in primary care, so it became my goal to come to the US to be trained in family medicine and sports medicine. You got your medical degree at Chonnam National University in South Korea and then came halfway around the world for your residency in family medicine at SIU School of Medicine. What was your next goal? A sports medicine fellowship was fundamental in advancing my medical career toward the Olympics. I found a great mentor in Dr. James Daniels at SIU’s Quincy Family Medicine. I had a variety of different experiences, working as a collegiate team physician, in sports medicine and orthopedic outpatient clinics, at mass sporting events like the Chicago Marathon and Triathlon, and gaining Division 1 level experience at the University of Missouri Columbia. After my medical training, I joined SIU as faculty in 2016. At that time, I heard that 2018 Pyeongchang Winter Olympics and Paralympics Organizing Committee was recruiting sports medicine specialists for the games. I applied online and was interviewed by three of the top Olympics officials, who all appreciated my experience in sports medicine in the US. I was enrolled in the official Olympic medical provider list. I participated in a test event for the Winter Olympics, the Women’s World Ice Hockey Championships in March 2017. How did you qualify for the International Olympic Committee (IOC)’s medical program? I had formal training and certification in sports medicine in the US and participated in as many national sporting events as I could. I’d strongly expressed my passion to participate in the 2018 Winter Olympics in my personal statement, and I had great letters of recommendations from my SIU colleagues. I was accepted to the IOC post-graduate sports medicine diploma program during my geriatric fellowship in 2015. The faculty for the course are IOC medical commission members and leading Olympic doctors representing their countries. I completed two years of online course work, assignments, written exams and attended an onsite workshop at the University of Calgary Olympic Research Center in Canada. It was a challenge alongside my fellowship and faculty work at SIU, but I did my best and successfully graduated in September 2017. Tell us about the medical teams. We have three medical teams at the Sliding Center: the FOP (Field of Play) team, a medical station team and a spectator area team. The FOP team provides onsite sideline care for injuries during the training sessions or games. The team consists of three doctors, three nurses and 12-16 EMTs. The medical station team has two doctors, two nurses and two EMTs. Injured athletes will be transported to our medical station for further evaluation. Or an injured athlete or team associate can walk in to the medical station for any medical issues. The spectator area medical team consists of a doctor, two nurses and one EMT. It’s an 8 am to 10 pm schedule. I’ll be checking the venue in the morning, educating and training the medical teams, supervising at training and exhibition games, attending team meetings, checking the venue again and supervising at the main games in the evening. If an athlete is injured, I need to manage both the sideline of the sliding center and the medical station and arrange for transportation to the Olympic Village medical center or a designated tertiary hospital, depending on the severity of the injury. Will the weather be a factor? The weather in PyeongChang is very cold right now; it’s been -5*. I’ll be spending about half the time there outdoors, checking on the team’s medical needs. I’m used to the cold weather here in Illinois. We’ll see if it will help me get accustomed to this. Dr. Jeong on the sideline during the women's skeleton and (at right) greeting Team USA athletes and their coach in the finish house during women's bobsled training. 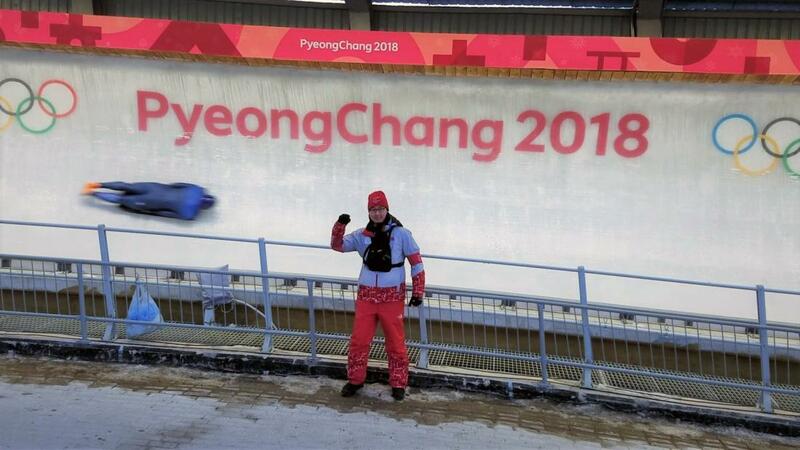 Watch for more information and photos from Dr. Jeong here and on SIU Medicine's Facebook page during the 2018 Winter Olympics.